was recognized once again after being voted #1 in 2014. The awards aim to highlight the real superheroes across Coastal Virginia that work tirelessly to address the needs of the community and the people in it. 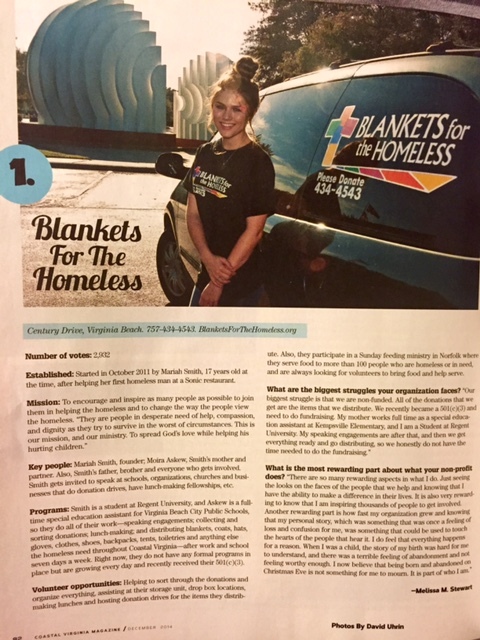 After a nomination period and a series of online voting rounds, Blankets for the Homeless was voted #2 in our region for the 2015 year. 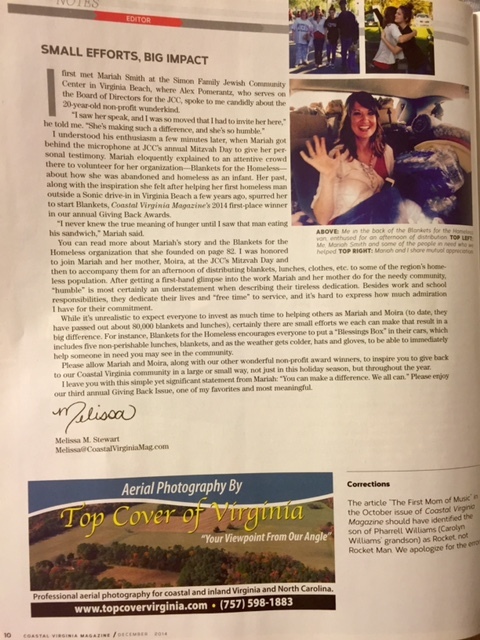 Special thanks to Coastal Virginia Magazine's publisher, Randy Thompson; editor and chief, Melissa Stewart; Creative Director, Dave Uhrin; Videographer, Chris Conway; and everyone who voted for Blankets for the Homeless in the 2014 Giving Back Awards. We are appreciative of all those who help spread the word and bring awareness to the community about the homeless. We also want to congratulate all of the other non-profits who work endlessly for their cause to make a positive impact. This beautiful video is titled "Homeless to Helper" The 700 Club told Mariah's story two years ago.. they came with her documenting what she does to help the Homeless. A local news anchor found footage of Mariah as a baby from a news cast 21 years ago when they were searching for her birth parents after being born and abandoned on Christmas Eve. That footage is in this video. Please watch this video. This is another story by The 700 Club a year later showing how rapidly Mariah's organization has grown...this video shows Mariah at a Church with hundreds of volunteers she inspired they are helping her make 100 lunches and Christmas stockings for the Homeless they also filmed her distributing everything to the Homeless. Mariah Smith spotted two women walking out of the woods in the late-afternoon light. The 19-year-old waved to them, then jumped out of her van and with her mother, Moira Askew, yanked open its sliding door. The four greeted each other with hugs, then Tama Lindstrom peered inside the van. Its interior was stuffed with blankets rolled into tubes, jackets, water bottles and brown lunch sacks. "How do you even fit in there?" Lindstrom asked Smith, laughing. Smith smiled and gestured to a pile of blankets on the front seat. "I just put those on my lap and away we go," she answered. Smith, her mother and Lindstrom, who is homeless, have met up this way for the past year and a half. Five nights a week, daughter and mother go to wherever Lindstrom and others are camping and open the blue Chrysler's door to pass out a bounty of necessities. There are hats and gloves to fend off the cold, backpacks to carry belongings and peanut butter and jelly sandwiches to fill the belly and warm the heart. 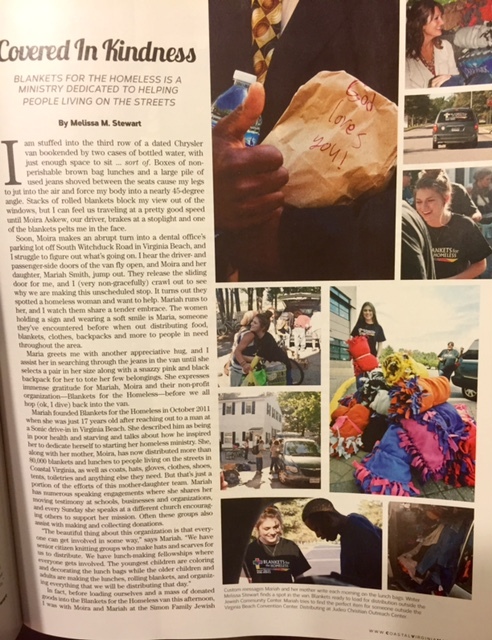 Smith started her mission, which she calls Blankets for the Homeless, about 18 months ago by soliciting blankets from Oceanfront hotels and making sack lunches, writing "God Bless You" on every bag. Since then she's received donations from churches, schools and businesses. So far she's handed out more than 20,000 blankets and, in March, she received a Virginia Beach Human Rights Award. Something deeper motivates Smith. She was abandoned as a newborn on Christmas Eve. Though she was adopted and is part of a loving family, she feels a kinship with people society may have abandoned. "I want them to feel love," Smith said. "I want them to feel like we're their family." That afternoon, Smith helped Lindstrom fill a plastic trash bag with lunches and water bottles, then carry the supplies to Lindstrom's campsite. "I recognize a lot of these blankets," Smith said as she gazed around. They chatted about Lindstrom's health, which had worsened, and her campmates' efforts to find work. Lindstrom repeatedly paused and told Smith, "You've done so much for me. I love you so much." Each time, Smith replied, "I love you, too." It started on a cold October night in 2011. Smith, then 17, and Askew were at a Sonic drive-in when they saw a man pushing a small cart that contained what looked like all of his possessions. His body shook with hacking coughs. Smith grabbed a blanket they happened to have in their car and their sack of food and gave it to him. Then the idea hit her. When they got home, she tore through closets, finding blankets they hadn't used in years. The next day, she made 300 fliers that she and Askew passed out at Oceanfront hotels and other businesses. 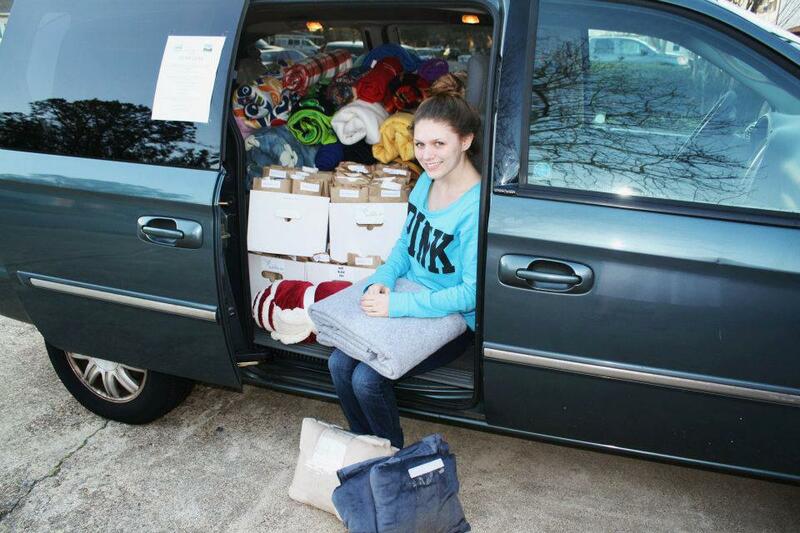 Within two days, they collected 50 blankets. Then they went hunting for people who needed them. The homeless are "not really hard to find if you're looking for them," Askew said. "It was shocking." They seemed surprised by the gifts, and "you could just tell that it meant everything," Smith said. Those first recipients told Smith and Askew where to find their friends. Smith pooled her baby-sitting money to buy lunch fixings: bread, chips, cookies, fruit and water bottles. She fashioned them after lunches her mother made and called them "a taste of home." Word spread about what Smith calls her ministry. 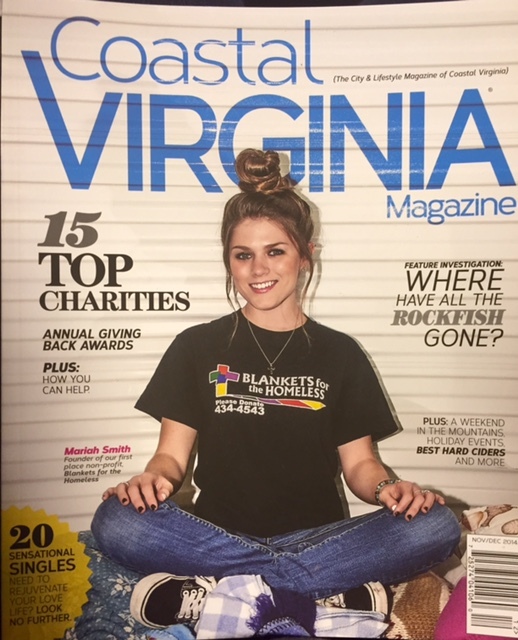 Soon, churches delivered blankets to her Kempsville home, and groups organized lunch-making and blanket-rolling events. AAAA Self Storage gave her a unit where she could keep donations. Smith and Askew started traveling to other South Hampton Roads areas to hand out blankets and lunches, sometimes helped by Smith's stepfather and brother. Each trip left her with a bittersweet feeling. Often, she cried as they pulled away and saw people scarfing down the food or pulling blankets tight around them. She said she felt honored to help those in need, but it was heartbreaking "that people have to live this way." Through it all, Askew was at her side, jokingly calling herself Smith's administrative assistant. She's never doubted her daughter's mission. She felt Smith was special from a young age. She stood up for those being teased and was the confidante of anyone with troubles, Askew said. On that October night, "she knew what she needed to do," her mother said. "I'm very proud of her." Others took notice, too. Churches asked Smith to speak at services. 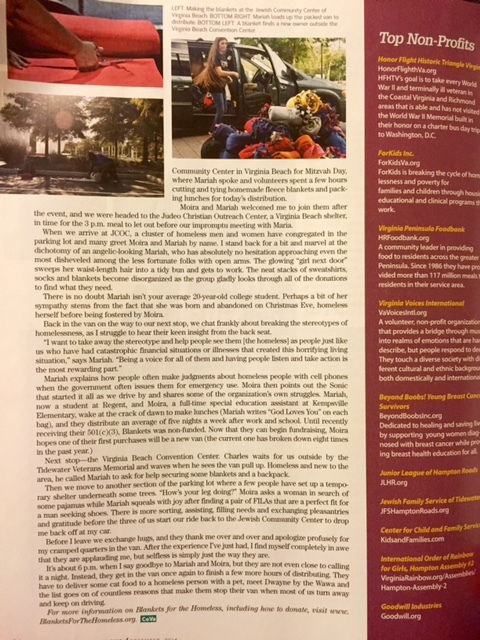 John Norris, senior pastor at Virginia Beach Free Will Baptist Church, hired an attorney to help Smith and Askew incorporate Blankets for the Homeless as a nonprofit, which they are in the process of doing. "Someone like Mariah you don't see every day," Norris said. Smith wakes up weekdays around 5 a.m. She stuffs sacks with cookie and cracker packets for two hours, then heads to Tidewater Community College, where she majors in human services. Askew gets Smith's brother up for school, then goes to work as a special education assistant. Smith crams in homework between classes. When she gets home at 3:30 p.m., she lines up pieces of bread on the counter and coats them with peanut butter or sometimes ham and cheese. Around 6, she and Askew head out to distribute. Their dinner is often drive-through fare eaten on the road. It may be 9:30 before they get home. Then they go to bed and wake up to do it again the next day. The schedule leaves little time for friends or other college-age pursuits. Still, Smith said she wouldn't have it any other way. She dreams of Blankets for the Homeless expanding, maybe taking over a warehouse. "I can't imagine not helping people," she said. Norris, who has decades of experience in mission work, wants Smith to pace herself. "I love her desire, I love her passion, I love her zeal, but it's got to be tempered," he said. He takes a fatherly approach about her going into homeless camps at night. "I just want the little booger to be careful," Norris said. "She'd walk right into the lion's den." One Wednesday night, the sun was setting as the Chrysler van pulled up to the Lighthouse Center near the Oceanfront, where the homeless can get day services such as showers and laundry. Fifteen people quickly gathered at the van. "We've got coats," Smith called to them. And, "Does anyone need blankets?" Though it was April, the evening air was cold, and those who waited in line showed several collars peeking from beneath their jackets. The city's winter shelter program, for which buses shuttle the homeless to area churches to spend nights, had ended that day, and this was the first night many of them would be back sleeping on the street. Smith pulled her jacket tighter. "Let me get another blanket, just to be on the safe side," a man called to her. "God bless you," she told the man as she handed him a fleece bedroll. "God bless you, too," the man replied. Smith smiled. She was where she wanted to be.